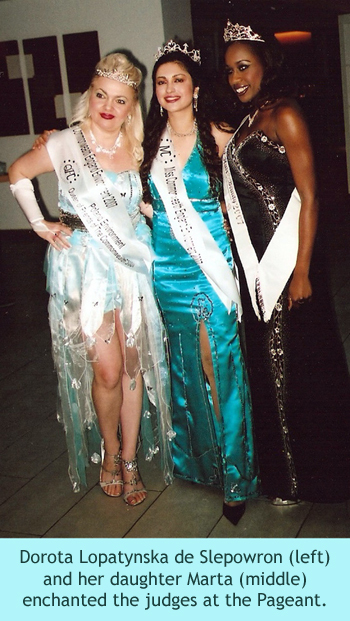 Press articles in 2008 about Dorota's continued achievements in Miss Commonwealth and acting. Apart from Bollywood films and British TV shows,Dorota acted as a blonde, glamorous millionaire Buffy Lavish in a hip hop music video Show Me Something in 2008. 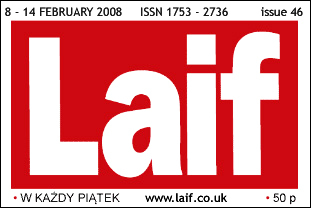 Local Polish tabloid "Laif" wrote an article "Polish Lady in UK Hip Hop music video" in February 2008. Another article "Polish Beauty Queens" appeared in The Polish Times in January 2008. This was about two Polish Beauty Queens - Dorota and her daughter Marta who won prestigious titles at Miss Commonwealth International 2007. The Polish Times, January 2008, "Polish beauty queens"
Two Polish ladies - Marta and Dorota Lopatynska-de-Slepowron - took part in the beauty pageant Miss Commonwealth International. Candidates form 53 countries contested in this pageant. All candidates were from the British Commonwealth countries. The event took place at Ramada Encore Hotel in Milton Keynes on 31December 2007. Miss Commonwealth is a beauty pageant different from others. Contestants need not to be of size zero or very young. The maximum age limit is 50. and there are different categories. The main purpose of Miss Commonwealth beauty pageant is to create public awareness about charitable work for good causes and to help other people. All the winners must be involved in charitable work for good causes. At New Year's Eve Gala at Hotel Encore, the stunning Beauty Queens from Poland - Marta and Dorota participated in fund-raising events along with other winners of Miss Commonwealth. The money was raised to help Arthritis UK, a charity for people suffering from arthritis. Dorota Lopatynska de Slepowron even offered her own painting on canvas "Friendship" to the charity, the painting was sold at an auction and the money went to Arthritis UK. At this spectacular event, the Beauty Queens demonstrated not only their big hearts but also intelligence while answering to questions by the sponsors who asked about their interests, knowledge of foreign languages and plans for future. After storming through the barrage of tough questions, the Beauty Queens appeared before the audience in their spectacular evening dresses. Dorota designed her own evening dress and also her daughter, Marta's. The Polish Beauty Queens emerged out of this magnificent event with flying colours, each lady winning two titles: Dorota - Mrs Commonwealth England Environment 2007 and Poland Environment Queen of Friends of the Commonwealth 2007; Marta - Miss Commonwealth England Environment 2007 and Poland Environment Queen of Friends of the Commonwealth 2007. Polish tabloid "Laif", Feb 2008, "Polish lady in UK hip hop music video"
Dorota Lopatynska-de-Slepowron, the Polish artist living in London, was in a UK Hip Hop music video, "Show Me Something" by Jack Frost and Max Browz. Dorota was selected out of 250 candidates. The video was shot in a casino scene where Dorota acted as glamourous millionaire, Buffy Lavish, who loves to put all in one card. Her husband also was present, taking camera shots. "I wanted everything to be on a professional level; hence I took several professional acting lessons and I learnt how to play with mimics." Explains Dorota, "I had to know how to express sorrow or joy when I lost or won, for example, without using words. However, Dorota not only acted with mimics. The whole image of Buffy Lavish was made up of strong make ups, expensive jewellery and black dress with lace - such a complete glamour image was not there even in the popular TV soap "Dynasty". This is not her first appearance in film sets. Dorota Lopatynska-de-Slepowron became famous as a first Polish female artist in Bollywood films. She admits that her agent is now trying to get next roles in the Bollywood. " The film will be shot in Bombay and shooting will last for 3 months. Hence, I am not sure whether I will be able to take up such a demanding assignment", says the Polish artist. Even if we don't see her in this production, we will see her in others. " My plans are now directed towards films", adds Dorota Lopatynska-de-Slepowron.